It’s funny to think that 10 years ago, exotic food to my family and me was Olive Garden (no offense). I don’t think I knew anything about Thai cuisine or Indian cuisine or had even heard about it. My first experience with eating Indian food happened 5 years ago at a gas station in the small town of Logan, Utah. Yes, you read right, a gas station. And yes, it was in Logan, Utah. The Tandoori Oven in Logan is a tiny restaurant attached to a Sinclair Gas Station. I discovered it while going to school at Utah State. You wouldn’t think it by the looks of it, but the food was amazing! 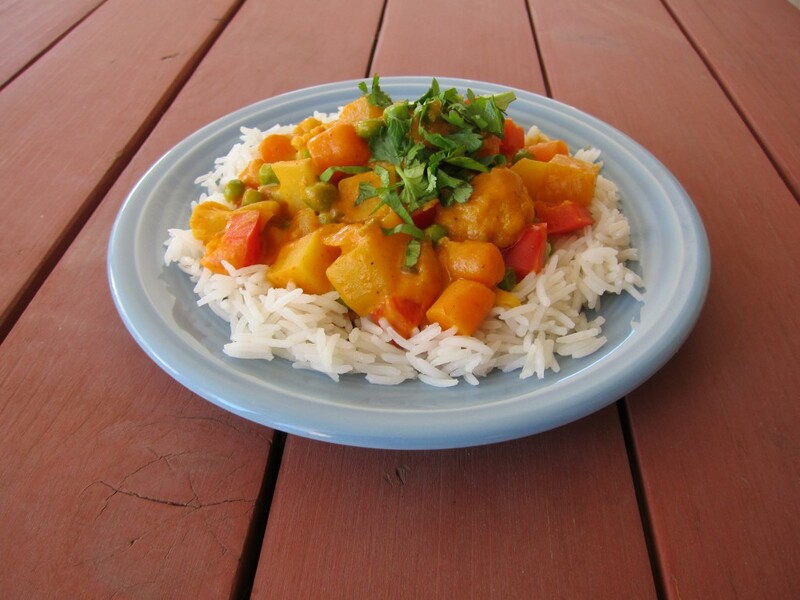 I immediately fell in love the warm spices and flavors of Indian food, and wanted to try my hand at recreating it. Heat the oil in a large pot over medium heat. Stir in the onion, and cook until tender. Mix in ginger, garlic, jalepeno, and curry powder, and continue cooking for 1 minute, until very fragrant. Stir in potatoes, cauliflower, carrots, tomato sauce and water. Season with salt. Cover and cook over medium-low heat for 20-30 minutes, or until vegetables are tender. Stir in peas, red bell pepper, and coconut milk into the pot. Reduce heat to low, and simmer, uncovered, for 10 minutes. 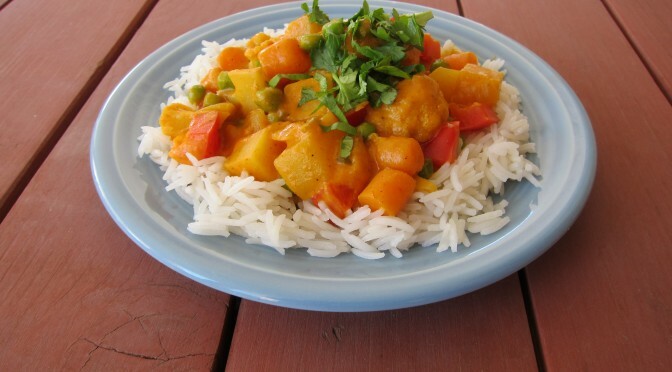 Garnish with cilantro and serve over rice. Enjoy! Back to what I mentioned at the beginning of the post (the part where my family’s idea of exotic food was Olive Garden). What’s funny, is that now, when I ask my mom what she would like me to cook for her, she always requests this dish. Since we started our journey of eating mostly vegan, this has become my comfort food. It is so delicious and satisfying. I am adding this to our rotation. This will be our Sunday dinner! FYI: did you know they have brown basmati rice in bulk at Winco?